Sea to Summit made a strong debut into the hammock market with a complete selection of products that can be used casually in a recreational setting, or for more specialized camping experiences. They also offer an amazingly lightweight hammock, that when combined with their other gear, makes a very competitive option for lightweight camping. Sea to Summit leverages their expertise in siliconized, high-tenacity Cordura® fabric in many of their product designs, which produces some amazingly light yet strong products. It may be hard to tell from some photos, but the Ultralight Hammock is very translucent. The nylon 66 monofilament fabric is woven with a mesh that produces a very sheer fabric. Under microscope, it looks like a net. It reminds me of what rip-stop fabric might look like if you took all the fabric and just had the rip-stop grid. The hammock comes in an expertly-engineered stuff sack. This is where Sea to Summit has really shown off, using their years of expertise in the storage and stuff sack market to make an exquisit compression stuff sack. For the ultralight enthusiasts out there, the sack is decidedly overkill, and you can save about 15-20 g if you want to remove it. However, the stuff sack is configured as a useful Bishop bag style, with two openings: a slit on one end where one of the hammock connection points is protruding, and a cinch-style opening on the other end for easy access. The stuff sack is positioned on one end of the hammock and makes packing up easy. There’s enough room in the sack where you could pack some suppension, if you wanted, or maybe even a gear hammock. While you can cinch the sack down to softball size, I prefer to keep it uncompressed so it can “smush” around my other gear to fill gaps easier. The fabric feels a lot like Tulle and has a whispy, somewhat crunchy hand. I feel a little naughty in the hammock, like I’m wearing some very light negligee. That feeling leaves the moment I start to relax. Now, the hammock is small. At only 8.5 ft (2.6 m) long, it’s one of the smallest hammocks on the market that’s designed to be slept in. I’ll be the first to tell you this hammock isn’t for everyone. It’s not an “everyman” hammock, nor was it designed to be. However, it is a perfectly modular hammock that can fit into any number of activities, including day hikes and short trips, if you don’t intend to sleep in it. The Ultralight has short webbing loops sewn directly into the end channels and integrates a buckle made from high-strength, lightweight aluminum 6061. 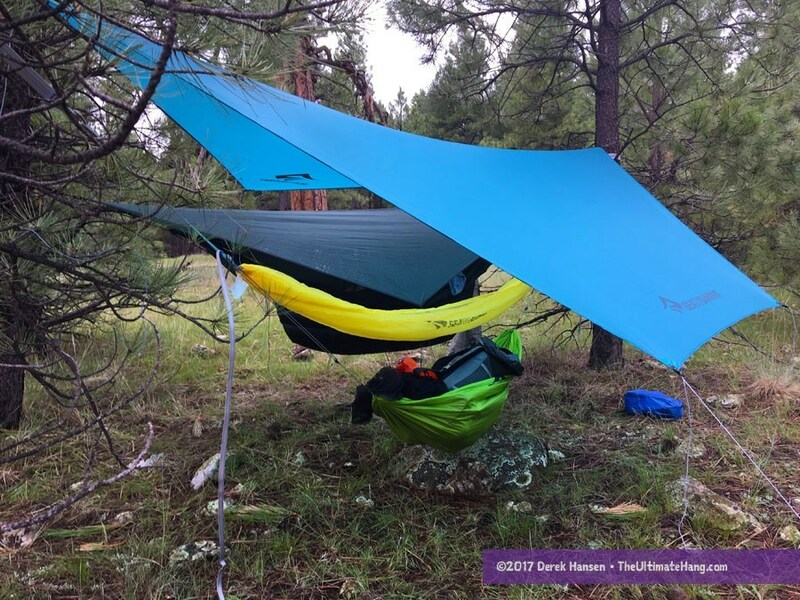 This configuration is similar in some respects to the Therm-a-Rest Slacker hammock, which provides some needed movement in the end channel to relax the side rails on the hammock allowing for a better, flatter diagonal lay. For ultralight backpackers, this hammock can really shave off a few extra ounces (not grams) from a kit, which is big deal. I’m just shy of 71 inches tall (180 cm), and I slept fine in the hammock. But, I like small hammocks (to a degree) and can tolerate most hammock sizes (understanding how to hang and lay in them helps!). I found that hanging under 30 degrees or so was just fine and I was able to lay diagonally without too many problems. Shoulder squeeze and leg hyperextension are potential issues, but good hanging practice can eliminate or mitigate them. That said, this isn’t the hammock I sleep on at home, or when I don’t have to worry about weight. Still, it’s a very attractive hammock, extremely well-made, and full of temptation. Like it or loathe it, Sea to Summit has decided to sell their hammock suspension separately. Twice. While this is not unique to Sea to Summit, I’m a little disappointed that the suspension and tree protection are sold separately. At some level, I can appreciate having them separate, for trips where the tree protection isn’t necessary, but I’d prefer they were sold together so customers don’t have to make a choice on whether tree protection is an option. Relative sizes of packed gear. The company says the straps are “non-stretch” but doesn’t provide material details. The suspension is 5/8 in (15 mm) wide and an astonishing 3 m long. In practice, I could remove a few feet and still be fine with the length. The tree protectors are a healthy 1.5 in (38 mm) wide, which is an ideal width, in my opinion. The webbing actually feels soft to my hand, compared with typical polyester or polypropylene webbing. The nearly 5 ft length on the tree protectors is a good mid-range length for a wide spectrum of tree diameters. The suspension, tree protectors, and hammock are all designed to work harmoniously together. Using plated steel buckles that interlock with each component, the system works seamlessly. The only thing to really watch for is the adjustable buckle needs to be fixed in the right direction to properly lock. The company has added a diagram on the buckle as a reminder. Adjustment is fairly easy. The buckle doesn’t bind or easily snag. Functionally, it is similar to a cinch buckle or other webbing-based buckles that you see from cottage vendors like Dutchware Gear. The gear sling comes in its own separate Ultra-Sil® stuff sack. I was hoping and expecting that the hammock would be made from this same ripstop material, but instead it uses a softer 70D ripstop nylon fabric used on their full-size hammocks. The gear hammock is not rated for human weight because of the lightweight suspension. The gear sling uses an adjustable nylon cam-hook that can hook on the ends of the hammock for a quick install. The sling is only rated up to 48 lbs. I’m a fan of gear hammocks and this one works well for its intended use. Still, I would have loved if the suspension were more robust (maybe 7/64 Amsteel?) so I could have used it as a chair around camp. Or if the material was Ultra-Sil®, it could double as a weather cover. The sling easily held my backpack and extra gear, keeping my water bottle within easy reach. I love keeping my gear off the ground, especially when conditions were wet and muddy. The bug net is a 360° style that fully encloses the hammock and has room for the gear sling underneath plus several inches. The ends use a shock cord to cinch and close up the collars. A short, collapsable tent pole is included to spread apart the bug net right in the center. The zippered entrance is on one side and opens just off center. By far the most questions I’ve received since I began reviewing this kit was around the bug net. Does it really work? Does it compare with other 360° bug nets? Does it work to keep the netting off your face? In a word, yes. Installing the bug net is about as cumbersome as any comparable net, by feeding the hammock through the net collars. Since the bug net uses the structure of the hammock to stay suspended, it cannot be hung independently, which could make it a little easier to set up. All 360° nets require some manipulation to get set up, and they are all notorious for dragging on the ground, picking up bits of nature along the way. This bug net is no different. In terms of working, I was delighted to find it worked better than expected. Without any internal supports, like a ridgeline, or external supports like tie-outs (used by most other manufacturers), the Sea to Summit design holds its shape well. Part of this is possible due to some shock cord threaded into the hems along the top edges that can be adjusted to “shorten” the bug net and keep it taut across the hammock. Since the Ultralight hammock is so short, I had to pull the adjustment points nearly to their limit. The head room distance is reduced with the Ultralight in play, but it’s workable. Using a generic (non-Sea to Summit) hammock with the bug net. A hammock up to 11 feet long will work fine in this bug net. While the craftsmanship and detail work on the netting is top-of-the-line, the mesh holes seemed large, not exactly no-see-um. The mesh is listed at 500 holes/in2. The most effective bug nets have small mesh to deter bites from mosquitos and minuscule sand flies (Phlebotominae). Sand flies vary in size from 1.5 to 3.5 mm, so no-see-um netting that has 1 mm holes (roughly 645 holes/in2 ) is recommended (in contrast, mosquitos vary in size from typically between 3 to 6 mm). It’s a tough balance because smaller mesh size means less breathability and limited visibility. The Sea to Summit net is a good balance and works well for mosquitos, but I would recommend treating it with Permethrin if you plan to camp where the smaller sand flies are present. However small the netting may be to keep the bugs out, it’s the bites through the netting and fabric that’s more a concern. I found that the tent pole design is very effective at keeping the net off my head and face, a feature not found in other nets. My feet still touch the netting, but as long as I kept my feet in my sleeping bag, I was fine. I didn’t experience any bit-throughs during my field testing. The Sea to Summit Hammock Tarp uses a bold design, combining both a hex panel and a diamond panel into a single shelter. With their focus on a lightweight, compact, yet functional designs, I think they succeeded. Diamond tarps have long been used with hammocks and work extremely well at providing ample storm coverage, but they don’t perform the best in sideways rain. The idea is that the hex panel would be pitched against the prevailing wind to provide additional coverage and allow the diamond side to maximize ventilation and views. On the various trips I tested the tarp, I found this technique worked beautifully. On a canoeing trip with rain in the forecast all weekend, I had a great opportunity to get real-world results. I’m happy to report I stayed dry and I had excellent views. The edges use a simple rolled hem and the corners are all reinforced with Hypalon, a synthetic rubber, and include grommets that work with trekking pole tips. Each tie point includes ample guy line and line locks. The line locks slipped a few times in gusty wind conditions and I had to tie both sides of the line to keep it from slipping. The tarp packs down so small it nearly disappears. It packs smaller than the hammock and has become my new go-to tarp for lightweight trips. I have to be careful, however. I did puncture a small hole when during a gust of wind my pegs pulled and the tarp snagged on the ground. A simple Tear-Aid Type A patch fixed the hole and the ripstop grid prevented any major damage. The Sea to Summit lightweight hammock kit is extremely well made and thoughtfully approached. They succeeded in achieving a novelty in a market drowning with knock-offs and sameness. I was skeptical about the lightweight claims, but after seeing, feeling, and sleeping with this gear I am a believer. This is an excellent lightweight kit. The lightweight hammocks is definitely a niche item and is ideal for lightweight hammock camping. The other gear items can really span the spectrum of use. Sea to Summit also offers a more recreational hammock in two sizes (Single and Double) and the components work well together. The tarp is a big win. I’ll continue to use it whenever I can. The bug net has some brilliant designs. I’m much more a fan of integrated bug nets when weight is a factor, but at 13 oz, it’s among the lightest enclosed nets on the market. Suspension and Anchor System ♥ ♥ ♥ ♥ ♥ The strap set and hardware are perfectly matched for this hammock, by design, but are sold separately. Construction and Craftsmanship ♥ ♥ ♥ ♥ ♥ Superior materials, stitching, and build. The finish is clean, and the edging is straight and even. It’s some of the best work I’ve seen. Modularity ♥ ♥ ♥ ♥ ♥ The entire system is very modular and can be mixed and matched to work with other hammocks. Aesthetics ♥ ♥ ♥ ♥ ♥ The hammock is available in a few bright colors that are very attractive. Price and Value ♥ ♥ ♥ ♥ ♥ Every item is priced competitively and comparatively with other items on the market. For each item, I think they are priced very well. Imported. Absolutely. Like all hammocks, you can reverse-engineer the suspension to be whatever you want. For UL purists, this is a great option for this hammock. The metal hardware really bring it down. The stock suspension system is a lot heavier than the hammock itself! I’d probably keep a webbing loop in the fabric channel to reduce strain, and then add an Amsteel loop or Whoopie Sling to your preference. I think your size of the tarp in metric went wrong, 90x120cm won’t cover much. Ha! Yes, that would be a small tarp. Thanks for the catch. I missed that conversion. It’s fixed now.